Gloucester threw off their big-occasion chokers tag as they beat Newcastle 34-7 at Franklin's Gardens to claim the Anglo-Welsh Cup at the third time of asking. After falling in the final in the last two seasons, Gloucester produced a fizzing performance as they outplayed the Falcons and outscored them four tries to one. Given Gloucester's superior power and creativity, they were somewhat wasteful in going into half-time with just Tom Voyce's converted try and a Nicky Robinson's penalty to their name. Newcastle could have been closer had Jimmy Gopperth not been unusually wayward with his kicking at goal. Gloucester continued to dominate in the second half and ran in further tries through Eliota Fuimaono-Sapolu and Charlie Sharples with Robinson, who played a vital hand in both on his way to the man of the match honour, kicking both conversions and another penalty. 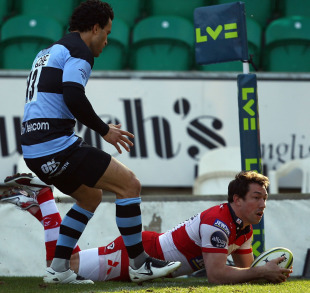 Luke Eves crossed for Newcastle but Gloucester finished off with flurry and a late converted try from Darren Dawidiuk. Gloucester profited from a powerful start when Voyce squeezed over in the left corner in the sixth minute. A strong scrum allowed Luke Narraway to exploit space down the blindside and, when the ball was spun back to the left, they had the extra men for Tim Molenaar to put Voyce over. Nicky Robinson added the conversion with a sweet touchline strike. The score drew a spirited response from the Falcons as they poured forward but on a couple of occasions they lacked the required control in contact and gave up turnovers just as they threatened to break into Gloucester's 22. Gloucester, on the back of ten successive wins, were evidently the more confident with ball in hand with the likes of Sharples threatening on the right flank. And it was his run in the 20th minute that led to a penalty for Gloucester which Robinson duly stroked over to extend the Cherry and Whites' lead. When the opportunity came for Newcastle to open their account, the normally reliable Gopperth pulled his kick to the left of the uprights. The New Zealander's kicking was inches off again moments later when he just failed to pick out Eves with a cross field kick, which would have sent the left winger into the corner had it gone to hand. And it got worse for the Falcons fly-half as he missed another penalty from in front of the post, albeit 40 metres out. By this time Gloucester could have been further ahead but for some casual execution in the Falcons' 22 with Fuimaono-Sapolu notably among the culprits with a couple of sloppy no-look passes. Sharples continued to cause problems for Newcastle and the Falcons were thankful for Gopperth's covering defence when he halted the flying Gloucester right wing after Robinson's smart break. It led to a penalty for Gloucester but Robinson missed for the first time. Complacency appeared Gloucester's biggest enemy early in the second half as they gave away a succession of turnovers in promising positions. But as they dominated possession there were few chances for the Falcons to attack and Robinson landed a penalty with half an hour to play open up a 13-0 lead. When Newcastle got the chance to press with a lineout in the Gloucester 22, they threw away the opportunity with their eager midfield inexplicably going offside. And as if to define the difference between the two sides, Gloucester immediately went up the other end and the scored the decisive try with a wonderful move down the blindside. The ever-impressive Robinson was the architect as he jagged back to the blindside, linking up with Fuimaono-Sapolu who then found Sharples before Robinson took the inside ball on again with Fuimaono-Sapolu rounding off the try. Robinson added the conversion to extend Gloucester's lead to 20-0. Gloucester underlined their dominance with a third try in the 66th minute as terrific handling and flat passing in the backs, especially from replacement Freddie Burns, put Sharples over in the right corner. Robinson kept up his immaculate kicking record with the touchline conversion. Gloucester scrum-half Jordi Pasqualin, who will join Newcastle next season, then denied his future team-mate Hall Charlton with a superb smother tackle. But Newcastle did grab a late consolation try when Charlton's short ball allowed Eves to crash over with five minutes remaining. But Gloucester had the final word as the forwards took over to drive Dawidiuk over the line and Robinson fittingly converted to seal the win and book his side's place in next season's Heineken Cup.